Spoletois a beautiful old town with roman and medieval monument, including the famous and spectacular tower Bridge locally known as the stone blade and the Rocca Albornoziana. The town has wonderful churches. 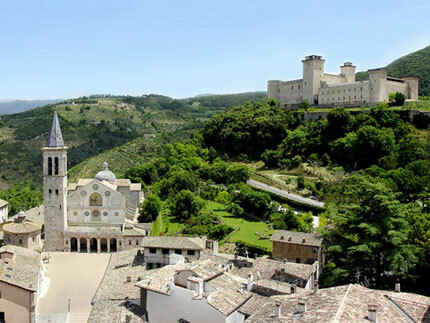 Spoleto is surrounded by a lovely landscape and wooded brills. 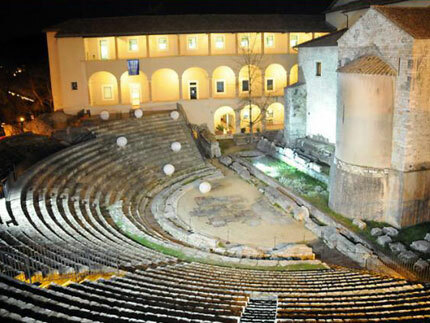 This town is important since roman times. 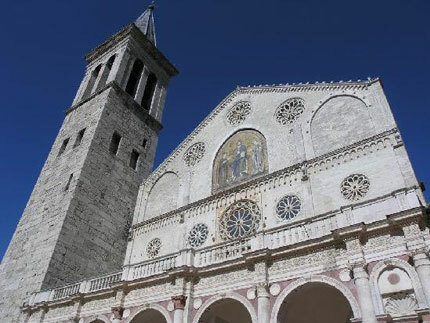 In 1354 the Ducky of Spoleto was incorporated in the states of the church by the papal cardinal Albornoz who built the castle to dominate the town. 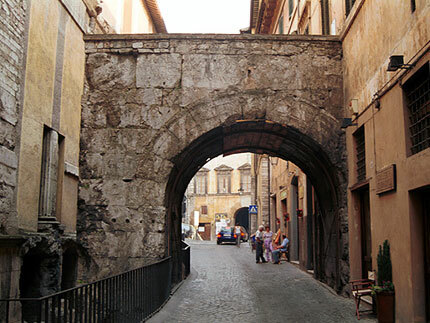 Via dell’Arringo, a famous stepped road, takes down to the cathedral. The dome was consecrated in 1998 and it has been restored after the earthquake in 1997. The façade is beautiful and it has an elegant Renaissance Porch (1491). Above it there are 8 rose windows and a splendid mosaic signed by “doctor” Solsternus in 1207. The hall tower is made from roman fragments. On the right of the façade there’s an elegant little chapel. The interior was transformed in 1633-44 by Urban VIII. In the 12 century apse there are frescoes of life of the Virgin by by Fra Filippo Lippi, one of the masterpiece of the Renaissance. At the top of Via dell’ Arringo is Palazzo Arcivescovile which houses Museo Diocesano and San Eufemia. Via Saffi leads uphill to Piazza Campello, which was transformed in the XVIII century.